This post is sponsored by Modsy. All opinions are 100% my own. Do you struggle to imagine how decor will look in your home? 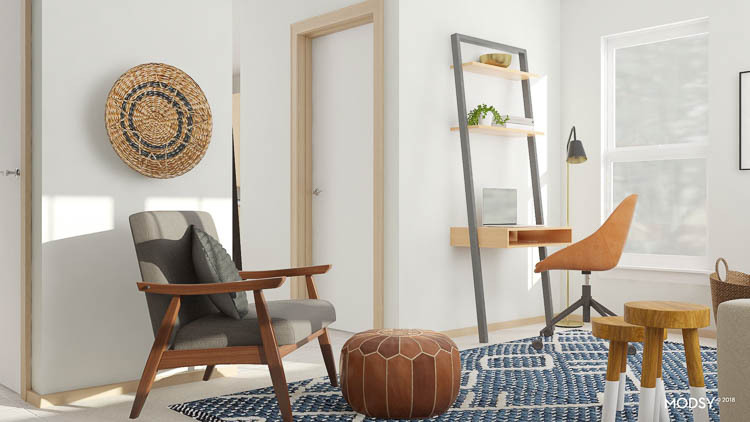 It always looks great in catalogs and websites, but if only there was a way to try furniture and accessories out in your own room before buying, right? 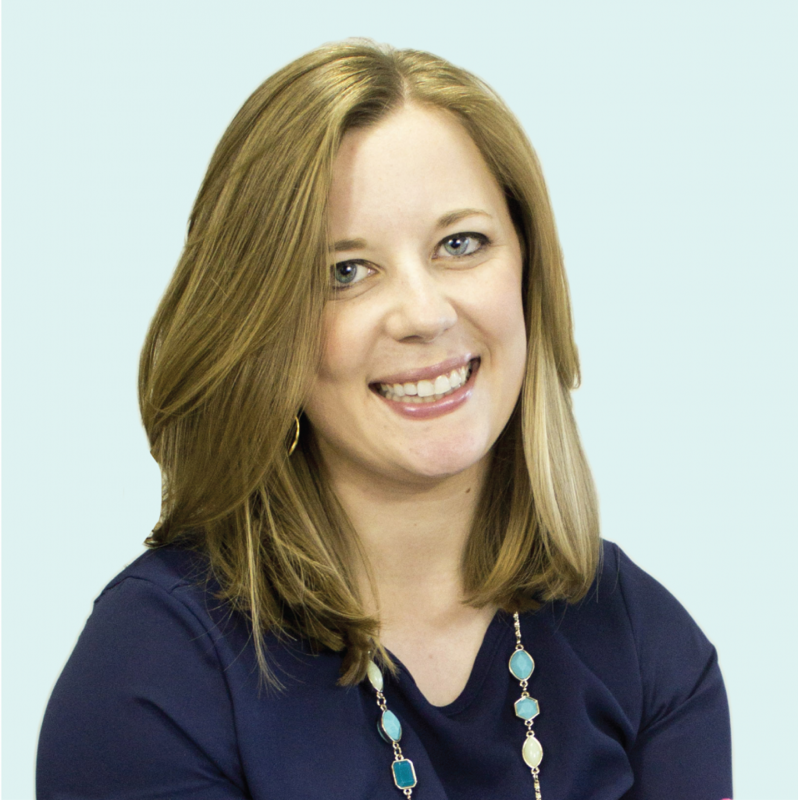 If you haven’t heard of Modsy, it’s a brilliant company that offers affordable virtual design assistance. I’m excited to introduce them to you today and share the designs they created for the room in our house that’s had me stumped for almost a year now. I used to play The Sims for hours and hours. 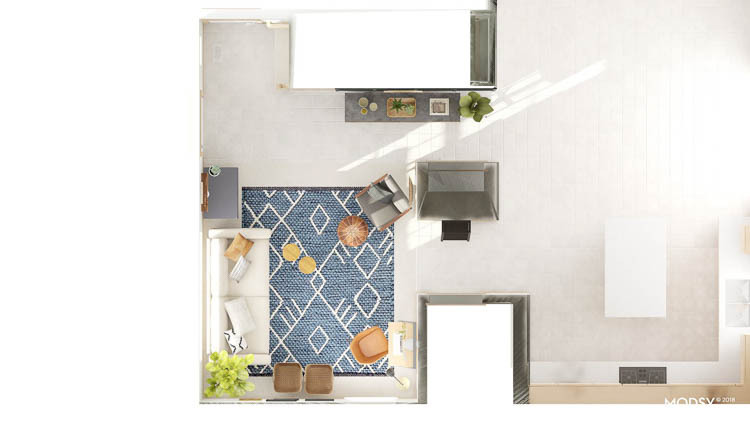 I spent literal days designing the perfect floor plan and lamenting over the best sofas and tables for each room in my house. Looking back, it’s no surprise I spent more time designing the houses than actually playing the game. What can I say, I guess I’ve always loved decorating! I’ve been thinking about The Sims a lot since we moved into this house last year. 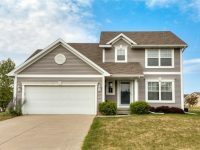 Trying to come up with the best furniture arrangements and shopping for new pieces to fill this larger house has me thinking to myself how amazing it would be if I could drop my house straight into The Sims and play around with the furnishings. Well, friends, I’ve found something even better than trying to replicate my house in The Sims! 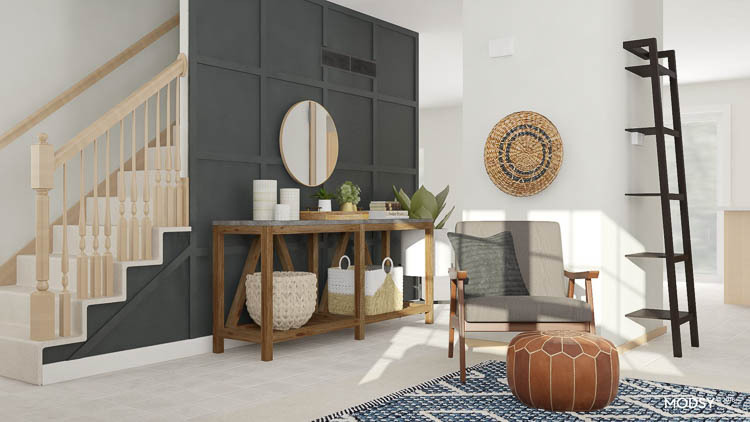 Modsy is a brilliant service that creates 3D renderings of your room so you can see exactly how things will look before you buy. 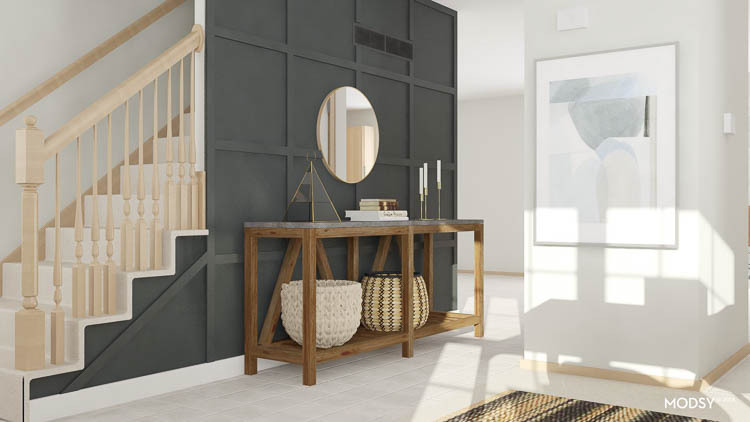 Their designers recommend layouts for your space using furniture and decor that is available from major retailers so you can achieve the exact look they create. It’s super cool! 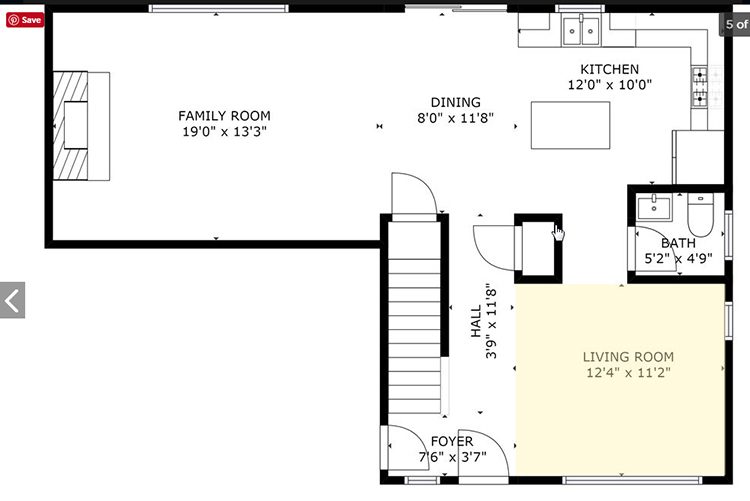 Modsy helped me create a design plan for the room in our house that has stumped me ever since we moved in last year. 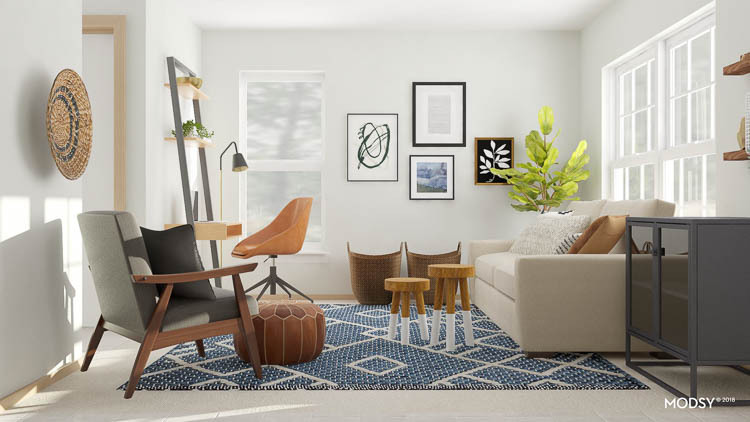 Keep reading to see the design plans for our front room and learn more about Modsy. The “front room” in our house has stumped me ever since we moved in last fall. Our front door opens up into this room, so it needs to be inviting and make a good first impression. 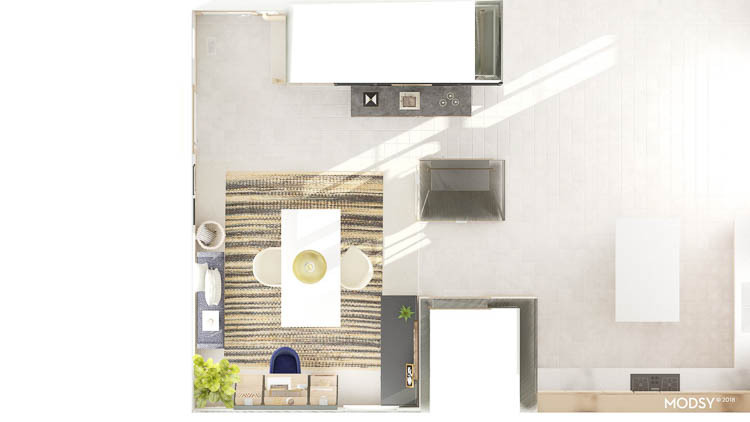 But I also want to create a room that’s functional and maximizes this space. I believe the last owners used this room as a dining room, and others in our neighborhood treat it as an office. Since moving in, I’ve set up a desk in the corner as my little office and the rest of the room has sat mostly empty with a few random pieces of furniture. It’s a nice perk to have a bonus room like this, but I want to be intentional with how we use it so it doesn’t become a perpetual dumping ground for random stuff that doesn’t have a home. 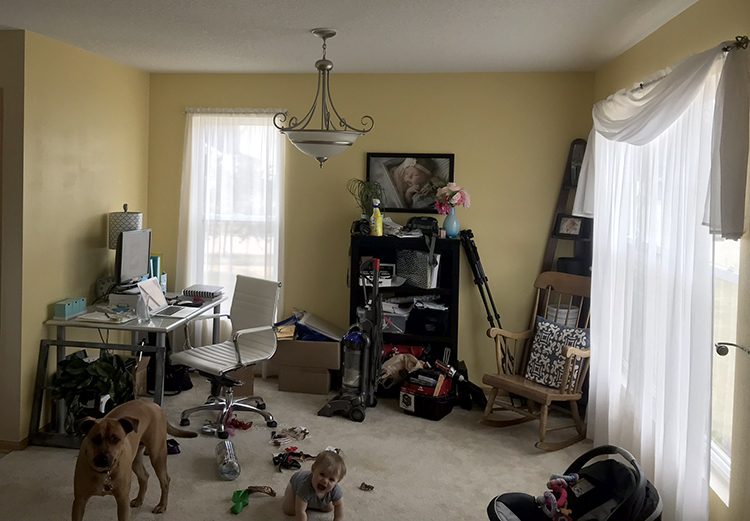 This room could serve so many purposes, but my current thought is to create a multipurpose room that combines the functions of a welcoming sitting room, playroom, and office. I also want to create storage space to hold all of my craft supplies. I cannot believe I’m sharing this photo on the Internet, but here’s a look at this room in its current unorganized, uninspiring, kinda-empty, very cluttered state. It clearly needs some attention. It’s one thing to see furniture perfectly styled in a catalog, but it’s tough to visualize how a piece will actually look in your own home. 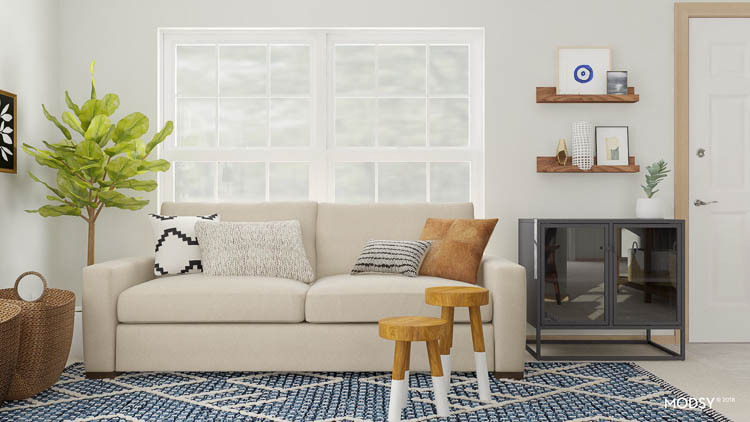 Modsy takes the guesswork out of decorating and furniture shopping by essentially allowing you to “try on” furniture before you buy. 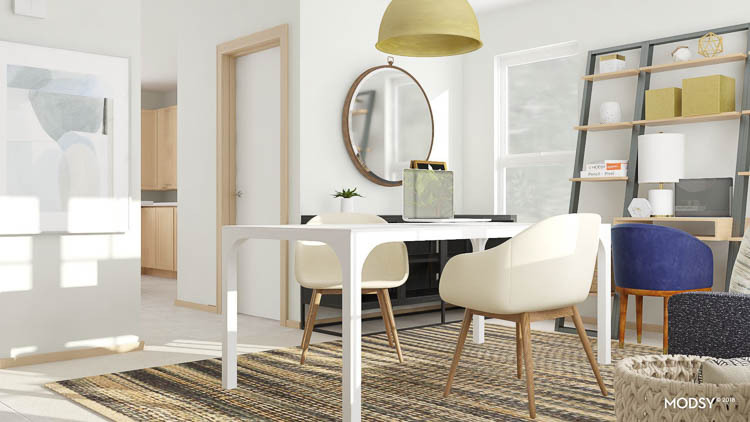 Modsy offers personalized home design by pairing you with a designer who will use their 3D visualization technology to create a custom design for your room. 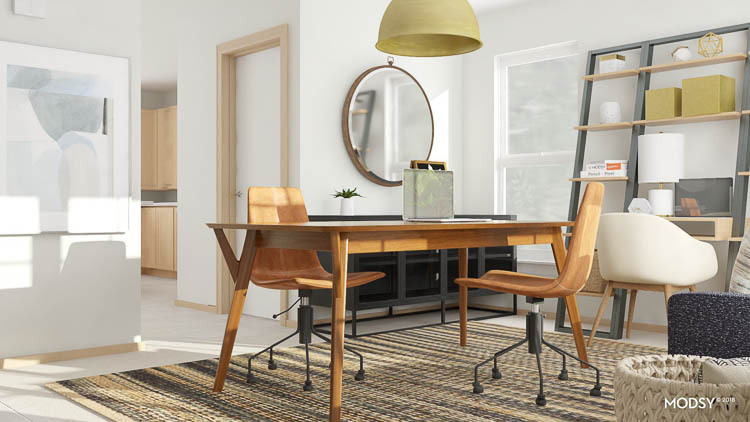 They have a catalog of products from hundreds of partners, giving you access to tons of furniture options! 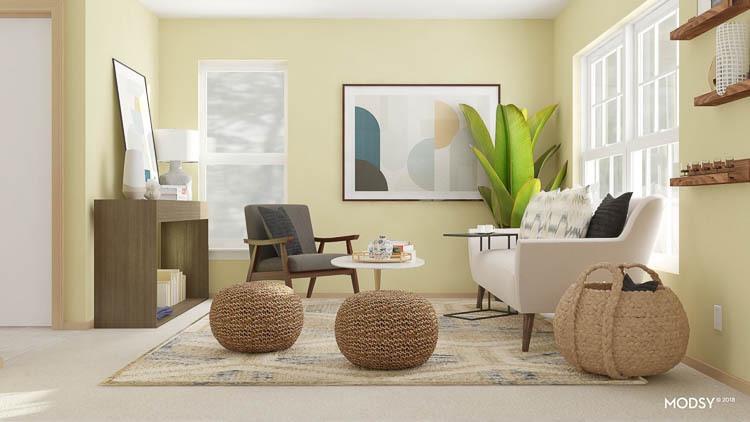 Their step-by-step process will help you create a cohesive style for your room, visualize your space in 3D, and provide a shopping list so you can buy the exact products used in your design. Show Them Your Space – Take a few photos and measurements of your space (clutter and all). No need to clean up the room at all since they will clean it up for you digitally! 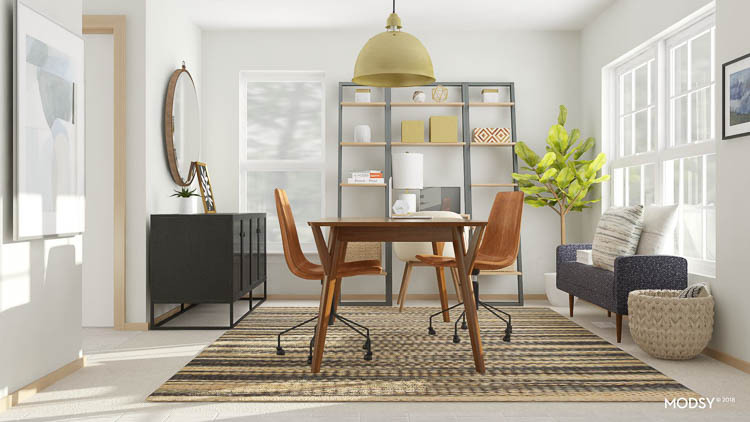 Tell Them About Your Project – Take their Style Quiz and tell them more about your project needs, existing furniture, and budget. You can also share a Pinterest board if you have one! Get Custom Design Plans – Modsy designers create 2 custom design plans of your room in 3D. Revise Your Designs – Work with their design team or their 3D Style Editor to fine tune your designs until they’re just right. It’s easy to request changes to your design until you get things looking just the way you like. Shop With Confidence – Shop directly from your design plans in one easy checkout and earn exclusive discounts. The whole process is really easy. I especially love how you don’t have to clean up your room at all, just take a few photos of it exactly as is and they will clean everything up for you in the 3D images! I’m also really impressed that Modsy offers unlimited revisions. I did a phone consult with my designer after the first round of designs and she made great edits based on my feedback. Plus she made several smaller edits after that until I was 100% satisfied with my space. At first, I thought they were just being nice because I was writing about them, but it turns out they offer unlimited revisions to everyone! Psst! Small Stuff Counts readers can get 20% off their next Modsy design using code COUNTS20 at checkout! That means you can get Modsy’s services for less than $50! 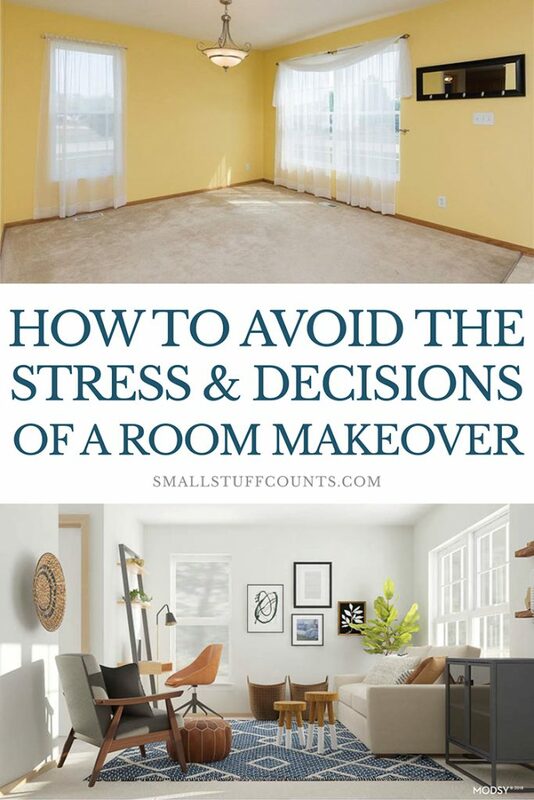 If you’re struggling with a room in your home and want to enlist professional design advice, this is the way to do it without breaking the bank. Now for the fun part: the designs! 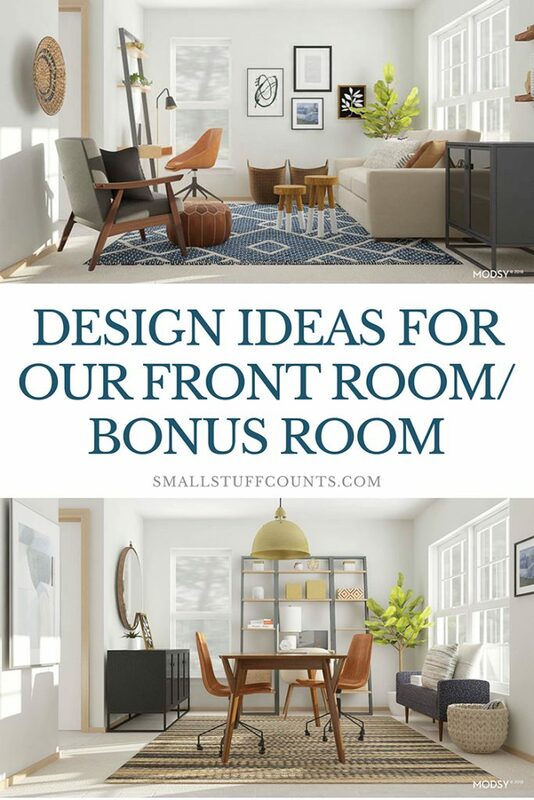 I’ve been torn between two basic layouts for our front room and, since Modsy creates two custom designs for you, their service helped me visualize how both options would look in the room. I thought I’d decided which layout I wanted but after seeing these designs, I’ve changed my mind! Let me show them both to you first before I tell you which one I like best ;). This first design is a sitting area. I requested comfortable furniture that’s good for kids and pets. I don’t want to end up with a stuffy, formal living room by any means, and I think my designer really nailed it with a laidback, lived-in feel. This was the first round. I forgot to mention in my notes that I don’t like my yellow walls, but it was a great start! After a phone call with my designer, she switched up some of the furniture to better fit my style. My main requests were white walls, a small desk, a bit of closed storage, and more contrasting colors. 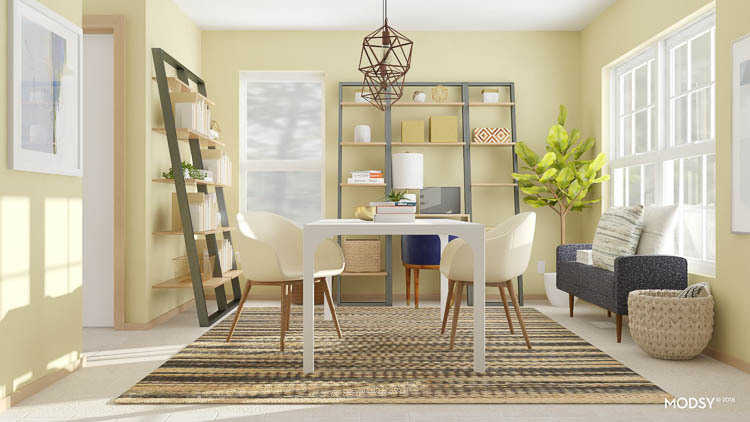 Modsy actually recently announced a specially curated collection of furniture from Chris Loves Julia, one of my favorite blogs, so I asked if she could incorporate some of those pieces into the room since I knew I’d like the style. Scroll through the next photos and check out the entire design!!! I’m seriously in love with everything in it! What do you think?! I am obsessed with the colors and vibe of this room. 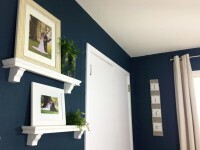 And I’m so glad I had the entryway makeover mostly done when I sent them photos so the designer could incorporate that look into this room design. This room only has a small desk area, but that would be enough space for me to work on blogging. There’s not as much storage as I was originally envisioning, but honestly this room is pretty small and you can only fit so much furniture in here. I really love the idea of our front door opening up into this seating area! 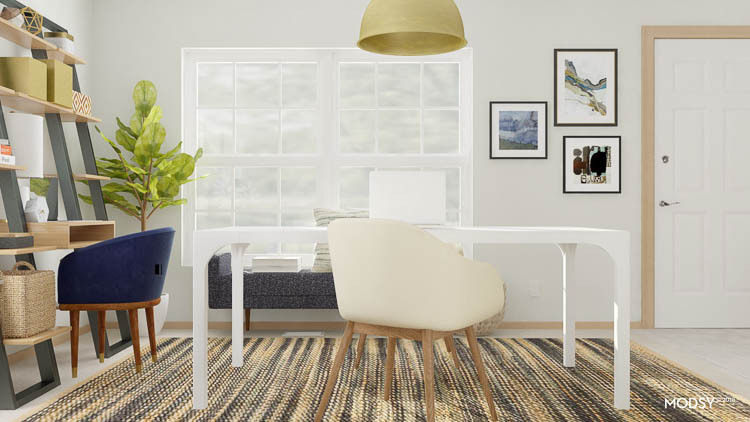 For the second design, I wanted to see how this room would look with a big work table in the middle. My vision is to add a pretty table with cute pendant lights over it that I could sit at when working on my blog and craft projects. I also think a table would give us a great kid-friendly space for coloring and crafts in the future. Here’s the first design. Again, I forgot to specify that I hate the yellow walls. But it really does look pretty, doesn’t it? So after chatting with my designer, she made some adjustments to make the below photo. It’s pretty neat to see exactly how a few changes in paint color and furniture can completely affect the look of the room, right? So I loved the changes she made, but something still didn’t feel quite right to me. I decided that the wood table didn’t feel like my style, so I asked my designer if she could change the table and chairs back to what she had in the original design. I’m still not 100% sure which I like best, but it’s awesome to be able to see multiple options! What do you think of layout number 2? I’m so curious to hear your opinion! I’ve honestly been pondering this front room since we first looked at the house a year ago, not quite sure what I would do with it. But for quite a while now, I’ve been envisioning a lot of storage on the walls with a big table in the middle and pendant lights hanging over it. 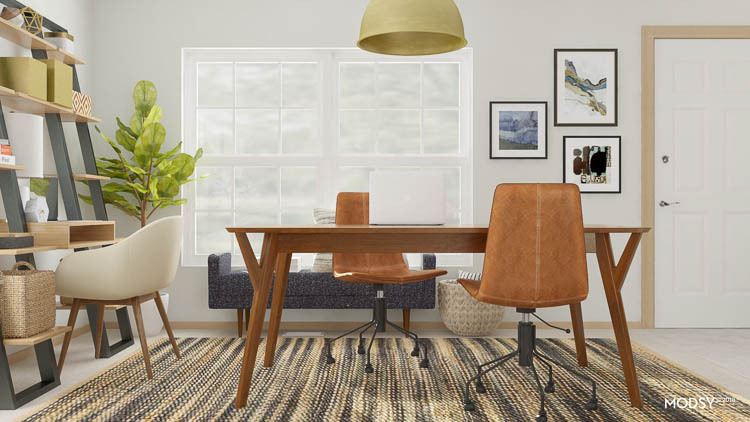 These designs from Modsy have really helped me get a feel for how much furniture I can fit in this small bonus room, and now part of me thinks a big table looks a little out of place here. What do you think? I’m leaning more toward soft seating now, although I’m still wondering if we would use the giant table more often than an extra seating area. Tell me what you would do in the comments! The good news is that I’m in no huge hurry to work on this front room and will probably slowly add furniture to it as time and budget allows. 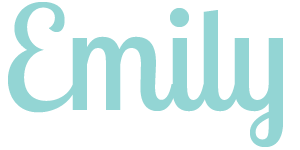 The even better news is that my friends at Modsy are offering 20% off to all the Small Stuff Counts readers (coupon code is COUNTS20). 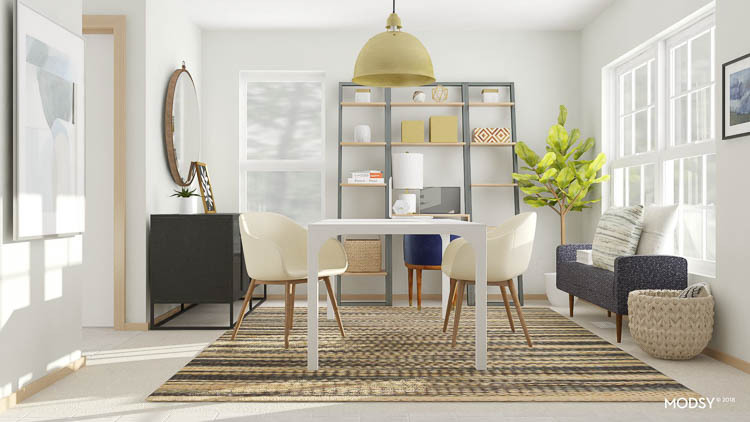 If a room has you stumped and you want some design help, definitely give Modsy a try. And if you end up working with them, I’d love to see your designs! What do you think of the designs for my front room? I need your help deciding which layout is best so let me know your thoughts in the comments! I too prefer the look of the seating area. I think that I would lose the small loveseat and get one of those extra large chairs for snuggling and storytime with the kids. I would then put it in the corner under the side window with a poufy ottoman, then you could have a small work table that sits against the wall under the big windows. You could use that as your desk and craft space. Where the plant is I would put your small storage unit and have a small bookcase (maybe three feet long) that defines the entry where the storage unit is now. It would allow you more storage that would remain unseen as you enter and give you a little display space on top of it, for a plant or family pictures. I love what Modsy did but I think that it doesn’t look very child-friendly. Hi Barb, thanks so much for all of these ideas! I do love the idea of a big comfy chair in the corner and definitely agree that I’d like to incorporate more storage than what the design shows. Have a great day! Hi Carina, thanks a million for all of your advice! It’s fun to hear everyone’s takes on the designs. 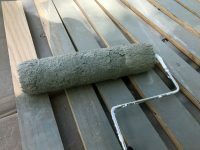 I love the idea of a Fixer Upper style work table in the middle if I go that route. And definitely agree with you that I’d want to add more storage to this room than what the designs call for. Have a great day!